Last week was SuperPhillip Central's 700th review, which introduced a new type of review to the site, the Review Redux. Now, the Review Redux returns again with another Mario game, but this time in a totally different genre. It's a look back at Mario Kart 7 for the Nintendo 3DS! Revisiting the wild, rigorous racing of Mario Kart 7! While Diddy Kong Racing seems to still be the king for me when it comes to kart racers, when it comes to kart racing series, then it's no question that Mario Kart is still the king for me. I like to make any excuse to replay the games in the series, whether it's to play with my friends and family, or just because I'm totally bored. I went to back to Mario Kart 7 recently, as I was hoping the online community was still available. Plus, I still had some kart parts to unlock. Returning to Mario Kart 7 has been a rewarding time in my gaming life, and it's great to see that I still find a lot to love about the latest handheld Mario Kart from Nintendo. Mario Kart 7 is the first Mario Kart in the series where kart customization is a feature as well as something that's important. While past Mario Karts had it where what weight of character you chose factored into that character's top speed and acceleration skills, Mario Kart 7 has it where choosing from three kart options: body, wheels, and glider, affects your kart's performance. It can affect your top speed, acceleration, handling, and off-road skills. When you begin Mario Kart 7, you have a very meager selection of kart parts available to you. However, as you progress through the game, collecting coins as you race, you receive new kart parts at various total coin milestones. For instance, if you collect 1,000 coins throughout your Mario Kart 7 career, then you unlock a new, random kart part. Now this way of unlocking kart content isn't perfect-- actually, far from it. As I stated, not only do you unlock a random kart part at various coin milestones, which means that if you're wanting a specific kart part for looks or for function, then you're a slave of the RNG, but you can only collect a maximum of 10 coins per race. This means per cup you can only get 40 coins. For kart parts that take that aforementioned 1,000 coins to unlock, for instance, that is A LOT of grinding for kart parts. Even then, you're not guaranteed 10 coins per race, as getting hit by an item knocks three coins away from your kart. I dunno, Mario. I still think your brother gives the best death stare out there. Thankfully, unlocking Mario Kart 7's cast of characters to race as is far easier a goal. All you have to do is win the various cups on various difficulties. The selection of racers this time around is an eclectic bunch with some new additions like Metal Mario, Honey Queen from Super Mario Galaxy (though shrunk to ridiculous size to fit in her kart), and Wiggler. However, some of the characters who missed the cut are very much missed by yours truly, such as Bowser Jr., Diddy Kong, and the most egregious loss for the reason that he has his track from Mario Kart DS in the game as a retro track, Mr. Waluigi, everyone's favorite racing wah-rrior. replacements are characters like Honey Queen and Metal Mario. The biggest new addition to the Mario Kart series this time around gameplay-wise takes the kart racing action beyond just the regular ground and puts it underwater and in the air. While the former isn't too interesting, save for changing how the karts handle and their physics while submerged in water, the air parts of Mario Kart 7 are an absolute blast. There are specific parts of tracks in Mario Kart 7 where your kart's glider automatically opens up, allowing you to take big air as you soar along the sky. Many of the newer tracks of the game contain areas that give you this temporary power of flight before you lose altitude and return to the ground. It's especially fun to see how far you can glide, sometimes even being able to skip modest portions of track to trim off some seconds from your overall time. In the Grand Prix case, it's awesome to gain some extra distance over your opponents or to help you catch up with the pack. Daisy soars over the idyllic settings of the track named after her, Daisy Hills. As for the racing in general, Nintendo once again delivers a tight, responsive racer in Mario Kart 7. You can opt to race normally with the Circle Pad to control your kart, or you can use new tilt controls for an interesting racing experience placing you in the driver's seat, given a first-person viewpoint as your race. 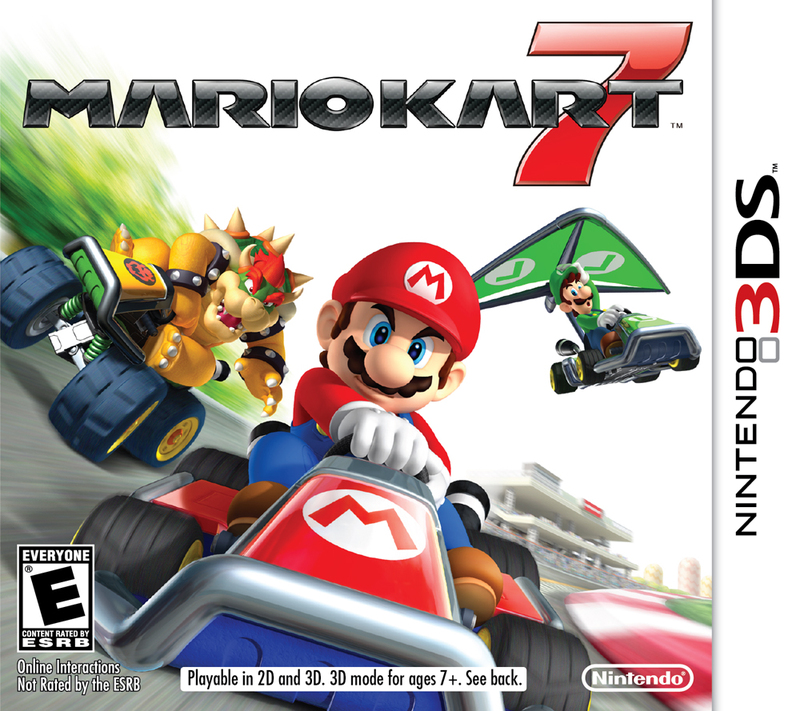 Mario Kart 7 shares how karts handle from Mario Kart Wii, its predecessor. As you drift, instead of moving the analog stick (or the Circle Pad in the Nintendo 3DS's case) back and forth to produce energy to unleash a turbo boost, you get energy from maintaining a drift. The longer your drift, the bigger boost you get when you let go of the drift button. In addition to the Mario Kart Wii way of earning turbo boosts, you can once again perform tricks off of ramps and jumps to get a minor boost when you land. Thankfully, you need not shake anything to do this. All that's needed is a tap of the R button as you reach the end of a ramp or jump. one will turn into a red one for maximum boosting goodness. Items have been an important part of the Mario Kart series since its inception on the Super Nintendo. Mario Kart 7 continues this trend, but this time the game offers three new items in addition to the ones featured from past installments of the series. The Fire Flower item gives the acquirer the ability to launch fireballs backward and forward until it runs out. These fireballs spin out racers for a brief period of time, but in a race, even a split-second's spin-out can win or cost someone the race. Then, there's the Tanooki Leaf that spawns a Tanooki tail on the rear of the user's kart. Not only can this swipe at and spin out opponents who veer to closely to your kart, but it can whack away items like shells and banana peels. Finally, the Lucky Seven item gives you a spinning roulette of items to use, most notably the Super Star. Just don't let your opponents steal it from you! The total amount of items in Mario Kart 7 is nice and varied, but yes, there is still the Blue Shell to worry about when you're in first place. Fortunately, it doesn't just fly over opponents as it reaches towards first place. Instead, it speeds along the track, able to collide and crash into other racers who are foolish enough to race in the middle of the track when it heads for first place. Mario Kart 7 sports 32 unique tracks. Since Mario Kart DS, the unofficial rule has been that 16 of these tracks are brand-new while 16 are from past Mario Kart games. Mario Kart 7 follows this rule to a "T." The original tracks featured in Mario Kart 7 are wonderfully designed, sporting plenty of unique locales, treacherous turns, underwater sections, segments where you can soar with your kart's glider, and many shortcuts and alternate paths. Some favorites of mine this time around include the Netherlands-like Daisy Hills, a track that features many rolling hills, and a very fun ending segment where you glide past the blades of several windmills as you re-enter the cozy-looking village where the track started. Then, there's two tracks situated in Wuhu Island, a place originally featured in Wii Sports Resort. These two tracks show off a varied amount of geography, as you race through the town, through caves, bridges, cliff-sides, and more. These races are especially notable for not being traditional three-lap affairs. Instead, they're so long that they're actually three-segment races, where each segment is a different piece of the track-- it's like one long adventure through Wuhu Island. Finally, there's my favorite iteration of Rainbow Road in any Mario Kart to date, a three-segment tour of space, featuring racing on a planet's rings as well as on the surface of the moon. The 16 retro tracks take some of the best tracks featured in Mario Kart history and breathe new life into them, giving some new sections that include Mario Kart 7's new underwater and gliding gameplay. New shortcuts have been added, such as Mario Kart DS's Luigi's Mansion, where you can use a Mushroom to boost up a ramp in the graveyard portion that allows you to glide over the graveyard's exit instead of navigating the turns inside. Favorites of mine here in the retro selections include Airship Fortress (DS), Koopa Beach (N64), Maple Treeway (Wii), Coconut Mall (Wii), Dino Dino Jungle (GCN), the aforementioned Luigi's Mansion (DS), among many others. I know you're excited about winning, Shy Guy, but let's be responsible racers. Both hands on the wheel, please. You can also gain new time trial ghosts via Spotpass and Streetpass, as well as race against said ghosts to try to improve your times in the game's 32 races. You can even compare your best times with the world on a very helpful and easy-to-read graph. Finally, Battle Mode is included, and this offers six arenas: three new and new from past Mario Kart games, to combat their opponents in with traditional non-team rules. Mario Kart 7's visuals range from very good to not-so-much. For instance to the latter, the character models sort of have the look of being carved out of wood, with blocky sections to them that don't appear like the best the Nintendo 3DS could do, even at the time of its release. However, the actual track environments and textures are lovely. There's plenty of stuff going on in the environments and some really cool effects, such as on a turn in Mario Circuit where cherry blossom trees unload their pink petals into the air and onto the track. The frame-rate of Mario Kart 7 is smooth as butter, offering a delicious-running game. On the sound side, you get the typical character voices and taunts in and after races, and the music is full of terrific tunes that are easy to want to hum along with. Just don't get too distracted by the music that you don't notice that red shell coming towards you! Mario Circuit is made even lovelier with these pink cherry blossom petals fluttering about the track. After replaying Mario Kart 7 after these 4-5-odd years, I still enjoy the game and the racing experience as a whole. I think a major part of that is just loving how well the tracks are designed and how memorable they are. They're just plain fun to race on, and the addition of underwater and flying segments really make the tracks more exciting. Sure, grinding for random kart parts isn't my preferred way of unlocking content, but it does give you something to shoot for, though I'm still only at about 6,500 total coins after this many years and my next kart part-unlocking milestone is at 10,000. Makes for some hard motivation to continue grinding, as you can probably understand. Still, whether it's engaging in a long sessions of Grand Prix cups against the AI or just doing a race online with friends or strangers, Mario Kart 7 remains a wonderful kart racer that while lacking in content, more than makes up for in its tremendous gameplay.